Yesterday (Boxing Day) Find My Past sent me yet another promotional email telling me that they had added more records to their website. This is all well and good, but finding anything on their *@~%#! * website has been quite difficult since its 'upgrade' in April. The old searches on the census returns that let you go straight to an address have been lost somewhere in the depths of their site and there are now dozens, if not hundreds (I have no idea! ), of little data sets arranged under a very few general headings, see the list in my screen shot on the left. The only way to make certain you get a hit in the data set you want is to (a) know the data set exists in the first place and (b) head straight to it via the A to Z index of record sets, the bottom option on the list. Which makes it a bit difficult if you DON'T know that a particular record set exists. 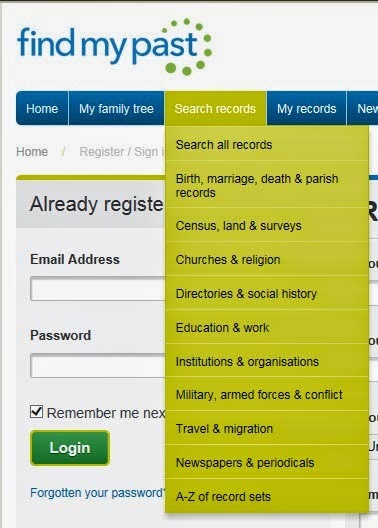 The Search All option does not return results from all the record sets - unless you leave the 'Where' option blank (ie don't put in Sheffield or Barnsley) meaning that you end up with dozens of entries to scroll through that you hadn't wanted at all. The only way to reduce the number is then to apply filters - but of course again you have to know what you are looking for to do this. My connection to family history in Sheffield is via my children (now well and truly grown up and left home) and my first husband (who shall remain nameless if you don't mind). I investigated that family tree more than 20 years ago when I was a single mother on benefits (so that tells you something about our dysfunctional family) because it was impossible to find a job that fitted in with dropping primary school age children off at school for 9am and picking them up again at 3pm. I used to spend the time between in Sheffield Archives - it kept me busy and saved on gas and electricity at home too! This is also when I started studying with the Open University. Purely alphabetically I tried searching in the Quarter Sessions records for Atkinson and recognised a name in the list of results almost immediately. Arthur William Atkinson was one of the great, great grandfathers of my children and an ancestor I had always felt was a good 'un as he worked as a blacksmith all his life. Unfortunately I was about to discover that hard work does not always equate to being a good man. The entry I had found was a transcription that showed Arthur, of 81 Porter Street, Sheffield, was charged with the malicious wounding of his son and that he went to trial on 5 July 1904. Out of interest I tried searching for Arthur William Atkinson in the All Records search - I put in Sheffield and did not get a hit on the Quarter Sessions record, however putting in Yorkshire brought back 1,403 results which did include it, halfway down the second page of results under Courts & Legal. So despite the new record set being specifically to do with Sheffield entering Sheffield in the All Records search is the WRONG thing to do! Still on Find My Past I looked Arthur up in the Sheffield newspaper of the time, the Sheffield Evening Telegraph. I have got fairly good at filtering the newspaper records by name of the paper and by date - the only thing that annoys me is that if you go a step too far on the filtering you can't step back, you have to clear the ALL the filters and start again. I fail to understand how the exact same record set, British Newspapers, can be offered to the public by the same company, BrightSolid, via two different front ends with two entirely different search engines. The search on the British Newspaper Archive is much superior to the Find My Past version. The above newspaper cutting (part of a longer report) from May 1904 shows his initial appearance in the Police Courts where he is committed for trial at the Quarter Sessions. A report of the Quarter Sessions themselves on 6 July 1904 showed that he pleaded guilty of common assault and was bound over to come up for judgement if called upon. However in order to find the second cutting I had to change my search to look for Atkinson only as his first names appear distorted on the page and have not been OCR'd correctly. Fortunately I had the date of the trial from the Quarter Sessions index so could narrow down my search by date to hits in July 1904 only. The BNA search engine allows you to set date as a parameter at the offset - on FMP I have to apply layer after layer of filter to get the same result. While I was searching for mentions of Arthur William Atkinson in the Sheffield newspapers I was made happier to come across an entry for him which shows the family in a much better light. This snip shows Matthew Jubilee Atkinson (born 1897 of course, Queen Victoria's Jubilee year!) as a Lance Corporal in the York and Lancaster Regiment in 1918. He has been awarded the Military Medal for Bravery. There in the caption are his parents, Mr and Mrs Arthur William Atkinson, now of 82 Carver Street. To be honest I haven't done a lot of research on the soldiers in this family tree - so I was surprised to see that the article notes that Matthew would be 21 on 3 August 1918. As it also states he enlisted on 17 August 1914 that makes him only 17 years old at that time. So here is a young man who enlisted underage at the outbreak of the war, apparently with the knowledge of the authorities, fought (according to the snip) at several large battles, Loos in September/October 1915, the first day of the Somme 1916 and the fighting on the Somme against the German advance in March of 1918. I do know that Matthew re-enlisted in the army after the war and that later he emigrated to Australia. Long ago a family member from his branch contacted me from over there. I wonder if they know that he won the Military Medal?